Looking for sushi around San Francisco’s Union Square? We really enjoyed Sanraku last night. The sushi was fresh and creative. The service was outstanding with servers ready with thoughtful and useful recommendations. Our server was particularly helpful with her knowledge of the varied and fairly priced sake list. The wine choices, while few, were respectable, especially considering that often wine options are an afterthought in sushi restaurants. The picture to the left (sorry for the poor quality, blame my phone) is their Harvest Celebration platter which is available only a few weeks a year. 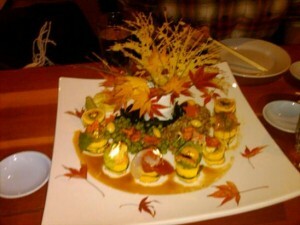 At $37, it’s expensive for six pieces of sushi but it was delicious and is a work of art on the table. I recommend making a reservation. The Sutter Street space is small and it was packed on a Thursday night. They also have locations in the Metreon and Four Seasons Hotel.